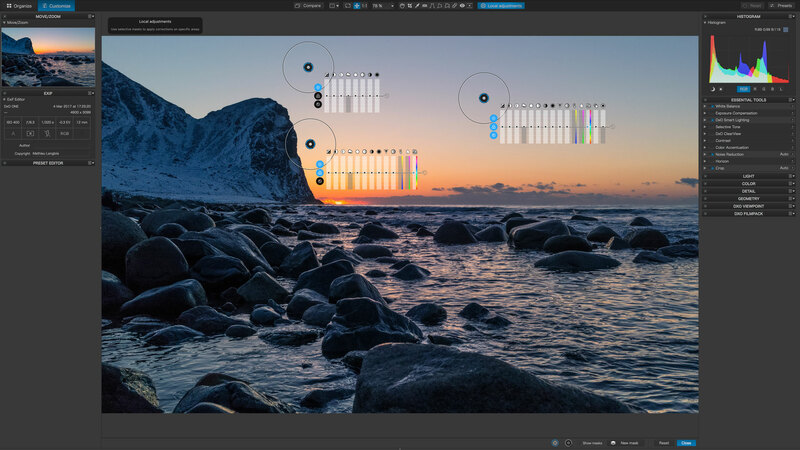 DxO has announced updates to both PhotoLab and its recently-acquired Nik Collection software. These products are likely to prove key to the company’s future as it restructures its financial activities around its software portfolio. DxO acquired the Nik Collection from Google late last year and its software engineers have spent the last seven months analysing and optimising the code to be compatible with the latest 64-bit Mac and PC operating systems, and the latest versions of Adobe applications Lightroom CC, Photoshop CC 2018 and Photoshop Elements 2017/2018. The Nik Collection has had a pretty torrid history. Originally developed by Nik Software, it was bought by Google in 2012 and initially sold as a commercial product for $150. Apart from the addition of the Analog Efex Pro plug-in, Google left the suite largely unaltered and undeveloped and eventually made it a free download before announcing it had ceased development. Analog Efex Pro is an analog film simulation tool that mimics old film types, photo borders, dust and scratches, double exposure, lens and motion blur and much more. Color Efex Pro is a large collection of photo filters which can be used individually or collectively in ‘Recipes’ that can be saved and re-used as single-click presets. Dfine is a noise reduction tool designed not for creative image effects but simply to fix the technical problem of image noise. HDR Efex Pro is an HDR tool that can merge bracketed exposures or tone map single images, then apply a range of different HDR effects. Sharpener Pro is a sharpening tool designed both for ‘creative sharpening’ to overcome image softness and ‘output sharpening’ to optimise images for specific output devices. Silver Efex Pro is a black and white tool that simulates the look of old films and darkroom processes, and perhaps the best tool of its kind. Viveza is a plug-in designed solely for local adjustments using Nik Software’s U Point selection and adjustment technology – though this is also present in other plug-ins. It was a relief to many that DxO announced late in 2017 that it had acquired the Nik Collection, which remains and extremely powerful and valued plug-in suite despite its age. Having updated the suite to work with modern systems and software, DxO has now made it a paid-for, commercial product again, though at pretty low price, given its scope and power. The Google Nik Collection is available at a reduced price of $49.99/£39.99/€49.99 until July 1st 2018, when it will go to its regular price of $69/£59/€69 until July 1st, 2018. This update is comparatively minor and adds in a number of local adjustment features DxO was unable to get ready in time for the original PhotoLab release. These include new Hue (HSL) and Selective Tone settings, and redesigned ‘equaliser’ sliders alongside each local adjustment. These are now split into Light, Colour and Detail tabs. 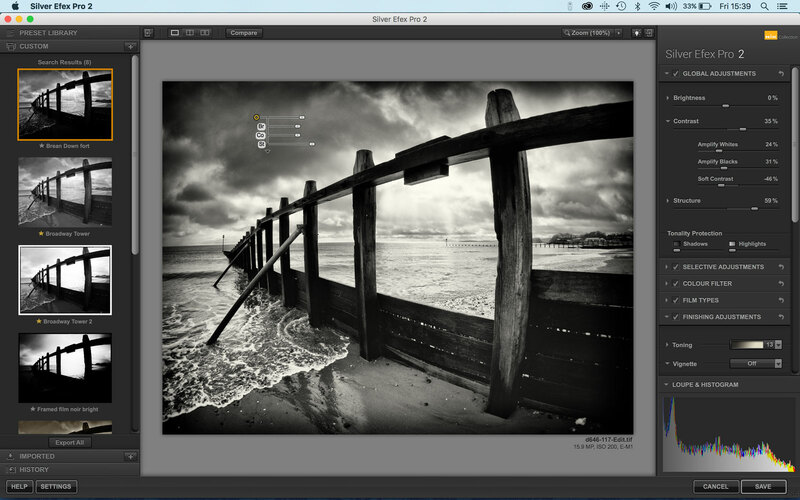 DxO has also added the ability to display a greyscale mask for U point adjustments using a simple keyboard shortcut. DxO PhotoLab is available in both Essential and Elite editions costing $129/£99/€129 and $199/£159/€199 respectively. It’s a free update for existing PhotoLab owners, and new users can download a 30-day trial version. PhotoLab 1.2 also integrates with DxO’s ViewPoint perspective control software and FilmPack analog film simulation tools, sold separately. I stay happily with Capture NX2 for my NEF-files (D800, D750) with its still very effective U-points. The route over TIFFs to Google Nik Collection complicates processing undeniably, but is acceptable for me. Once my camera bodies are due for replacement, I will have a closer look at DxO Photolab provided it will still be available then. In my first trial, I found Photolab too complicated to use. How did you manage to use CaptureNX2 for the D800 and D750 NEF files? D800-NEFs are compatible. For D750 NEFs there are free (donation based) conversion tools you will find in the internet when searching for “Capture NX 2 for D750” or the like. It is a very bad new for NIK lovers! I don’t want another software to use NIK than Lightroom and or Affinity Photo. Hi Claude, I’m not clear on why you might think this is “bad news” (for any camera brand) ? As Rod points out above; DxO has effectively “rescued” the Nik Collection from a slowly death … such that it’s now updated to make it compatible with (commonly used) Adobe products. If you’re happy with Lightroom & Affinity Photo – then you’re not missing out on anything. But, if you want the additional effects and features available with the Nik Collection – then you can now purchase an up-to-date version at a low/reasonable cost … with confidence that it will be maintained into the future by DxO. From a discussion elsewhere I thouhgt DxO would integrate a new Nik Collection in Photolab as they already implemented a U-point technology for local adjustments, similar to the way the former Color Efex Pro 3 which was was available as a special version to be integrated in Nikons CaptureNX2 RAW workflow. But asking now a (modest) price from those who missed the download of the free suite from Google Nik for an unaltered software is quite daring in my opinion. DxO is treating PhotoLab and the Nik Collection as separate products because they feel they have different (and different sized) audiences. This was explained during a press briefing I attended. The Nik Collection has broad appeal not just to DxO’s customers but to Lightroom and Photoshop users too, so it makes sense for them to make it available separately to this broader group and not tie it specifically to PhotoLab. I hope that helps – Rod. Full support for Adobe Photoshop, Lightroom, and Photoshop Elements CC 2017/2018: so that Nik Collection plugins can now be used without any issues with the very latest Adobe host applications. Full support for latest mac OS X system: so that Nik Collection plugins are now compatible with latest mac OS system updates. Fixed: Calling Nik plugins from Adobe Photoshop Filter menus instead of selective tool doesn’t create crash anymore. Fixed: Smart filters / Smart objects blend options from Adobe Photoshop layers can now be edited with no more issues. All of which goes to making the Nik Collection by DxO a firm base for enhancements and improvements that DxO will bring out in future releases. Note: If you’re currently not experiencing any problems with the old version of Nik Collection then you can always “sit this one out” – and wait for the next version from DxO, and re-evaluate then. > Full support for Adobe Photoshop, Lightroom, and Photoshop Elements CC 2017/2018: so that Nik Collection plugins can now be used without any issues with the very latest Adobe host applications. That already worked with the 2012 software. So .. not new. > Full support for latest mac OS X system: so that Nik Collection plugins are now compatible with latest mac OS system updates. 2012 version fully tested and working on macOS Sierra, High Sierra, and previous versions. > Note: If you’re currently not experiencing any problems with the old version of Nik Collection then you can always “sit this one out” – and wait for the next version from DxO, and re-evaluate then. Right. But as someone who paid for Nik in 2012 and then felt betrayed when Google made it free, give DxO money at this stage feels … like being hit on the head with a hammer. Google Nik collection indeed works well with my old Photoshop CS5. Hovewer, I recently started with Affinity Photo to replace CS5. There the collection works fine as well with the exception of Viveza which produces weird colours. This goes also for the DxO Nik collection and has widely been discussed on Affinity Forums as beeing a yet unsolved Serif-problem. I am thrilled to have these plugins available with full functionality on updated host programs. Well done DXO! DXO now needs to get on the stick and find a way to host the plugins from within DXO’s own PhotoLab software. I bought the DxO Nik product even though I owned the original and Google versions. Nothing wrong with supporting them especially since they rescued the product from extinction. It works quite well with Alien Skin and Adobe products. However, I still cannot fathom why they would give up (actually never supported) the Fuji X growing consumer base by not supporting the Xtrans type sensor. In their Photolab product. The excuse that it is not a standard bayer sensor is bull crap, especially since every other piece of software out there now supports the Fuji X series. I really like their photo lab options and features but can not be a customer of theirs due to their stubbornness. I don’t think it’s stubbornness. The explanation I’ve been given is that the DxO raw engine is designed around a regular bayer color filter array and cannot be adapted to the X-Trans layout. It’s true that other vendors do support X-Trans, but that doesn’t mean they do it well. Adobe Camera Raw regularly gets criticised for its X-Trans sensor rendering (It’s not great, but I don’t think it’s too bad), and while a bunch of other apps can process X-Trans files they often do a pretty poor job – it’s support in name only, and doesn’t deliver what the sensor is capable of.